Do you want to know how to be an Amazon seller and start selling products on Amazon? Amazon is the biggest online marketplace in the United States which sells goods ranging from books, toys, food, electronics, games, apps and much more. What started out as an online bookstore has now grown to a multi-billion dollar corporation which serves 11 global markets across North America, Europe, and Asia. Amazon’s net sales in 2017 was close to 180 Billion US dollars, making it an extremely lucrative marketplace for Amazon sellers to market their products. This comprehensive, beginner’s guide will show you how to make money on Amazon by becoming an Amazon seller. Amazon Seller Central is where you can manage your Amazon seller account. This is where you can add product listings, edit product information, add product keywords, make inventory updates, manage orders and payments. Register for a seller account here. Determine your product’s Amazon category. Some categories require additional approvals unless you are a professional seller. You can check your product category here. Choose your selling plan – Individual Seller or Professional Seller. An individual seller is for those who sell less than 40 items a month. On top of referral fees and variable closing fees, you pay an extra $0.99 per item sold. Choose professional seller if you plan to sell more than 40 items a month. Instead of the $0.99 fee per item sold, you pay a $39.90 monthly subscription fee but also get the full benefits of professional seller tools. Referral fees and variable fees remain the same. After registering, you can start listing Amazon products in your Amazon Seller account. Access your Amazon Seller Account via the Amazon Seller Login page. There will be a 2-step authentication to log in, so you must enter the code generated by the authenticator app, which you can download for any smartphone device. Want to learn more and get guidance about becoming an Amazon Seller? You can access Amazon Seller Support via the Amazon Seller University. If you’d like to contact customer support directly, use the Amazon Support page. Amazon Seller Fees are fees collected by Amazon whenever you make a sale on their platform. These fees apply whether you are a professional seller or individual seller. So here’s an example of what you would pay if you are an individual seller vs. a professional seller. The main difference here would be the per-item fee. Example: You sold a Baby Product priced at $15 + $5 for shipping (shipping fee is paid by customer). Here is the breakdown of Amazon seller fees for individual and professional sellers. Important note: Referral fee will always apply to the final amount the customer pays, even if you decide to sell the product at a discount. Note that the referral fee is not always 15%. It depends on your product category. For the complete breakdown of the fees and referral fee percentages, visit Selling On Amazon Fee Schedule. Now that you’ve got the basics set up let’s look at the exact steps on how to sell on Amazon. (aka how to make money on Amazon). There are only 3 things you need to prioritize if you want to start making Amazon profits quickly. Whatever product you are selling, you need to make sure you can sell it on Amazon at a profit. Which means, your revenue per item must be more than your total cost (Amazon seller fees + fulfillment costs + product cost). For example, if your total cost for an item of Baby Product is $10, the amount you charge your customer must be more than $10. We recommend you charge at least 50% more than the cost so you won’t be affected by fluctuations in your fixed costs. How do you want to ship your products to your customers? Do you want to handle fulfillment yourself or use the Fulfilled By Amazon (FBA) service? Your fulfillment cost will vary based on whichever option you choose. If you go with Fulfilled By Amazon, you’ll have to ship your products to Amazon’s warehouse, and they will handle fulfillment for you. You only have to factor in shipping costs to Amazon’s warehouse. If you wish to manage fulfillment on your own, you’ll have to account for your fulfillment costs such as shipping and warehouse storage. You can use Fulfillment by Amazon calculator to see if using their fulfillment services is cheaper than doing it yourself. Now that you’ve ensured your profit margins are healthy and have your fulfillment system in place, the last step involves getting traffic to your product listings. The way to make money on Amazon is to have your listing show up whenever someone makes a search on Amazon for your product keywords. For that, you have to understand the ranking factors of Amazon’s search engine (A9) and apply them to your listing. Amazon’s search algorithm is designed to show listings which are likely to get more sales. Naturally, your listing’s conversion rate can have a direct impact on your search ranking on Amazon. Your conversion rate determined by factors such as customer reviews, copy, quality of images and price. As a new Amazon seller, chances are you don’t have that many reviews or past historical data for Amazon to measure conversion rate. Therefore, Amazon will try to estimate your listing’s likeliness to rank based on on-page factors such as price, copy or images. Amazon pays attention to your customers’ likeliness to make repeat purchases from you. Factors which impact retention include seller feedback and Order Defect rate. Therefore, as a seller, you have to pay attention to your customer support and fulfillment process to make sure your customers are happy. Relevancy relates to how Amazon associates your listing with what people are searching. This factor is crucial because it’s the one thing you have the most control over. For example, making sure your Amazon listing is well-optimized with the right search terms people are using when they look for your product. Let’s now look at some listing optimization tips to boost your relevancy. Keyword research forms the basis of any profitable Amazon product listing. If you have not decided what to sell on Amazon, you should do keyword research first. If you have already decided on your products, you need to do keyword research to know which keywords to put in your Amazon listing. The easiest way to make profits on Amazon is to find out what products are people are searching for. To do that you can use tools such as Keyword Tool for Amazon. Keyword Tool lets you discover the most popular Amazon keywords potential buyers are searching for. All you have to do is enter your product keyword, and the tool will automatically generate a large list of related keywords for you to put in your Amazon listing. These keyword suggestions are pulled from Amazon autocomplete and is the most reliable and relevant source of keywords on Amazon. Once you’ve narrowed down your product keywords, there are 4 specific places you can optimize your Amazon listing within your seller account. 1) Product Title – Include your main keywords and related keywords in your product title. Think about what your potential customers would type in Amazon’s search engine if they are looking for your products. 2) Product Description – Here you can put your long-tail keywords and additional information such as key features and product benefits. You can also add stories here to convince your visitors to buy from you. 3) Key Product Features – These are bullet points on the product details page. Here you can include a summary of the key features of your product or keywords you have identified in your keyword research. 4) Backend Keywords – Last but not least, Amazon lets you put backend search terms for your product listings. Similar to the meta tags of websites, these backend keywords help Amazon’s algorithm understand the relevancy of your listing to a user’s search query. Be sure to include all your important keywords related to your product here. 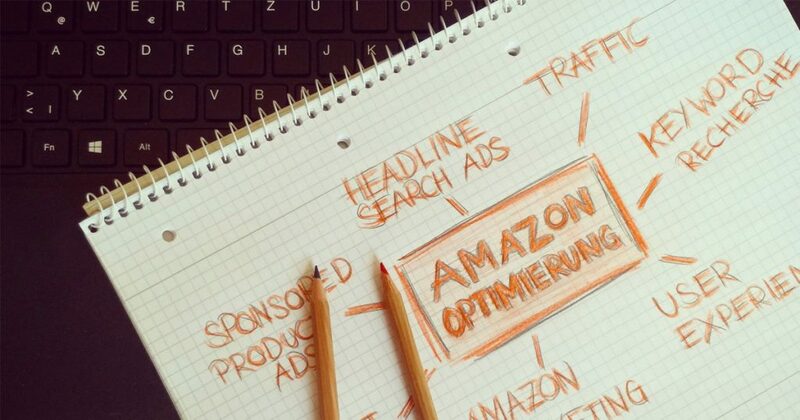 Having the right keywords in each of these sections can improve your listing’s overall relevancy so that your products will get shown more prominently on Amazon. And there you have it! The basics of becoming an Amazon seller and setting up your first Amazon listing. We hope this beginner’s guide on how to be an Amazon seller has been helpful. Here’s what you need to do to become an Amazon seller and start making sales. For Amazon product ideas, start with keyword research. Setup your Amazon Seller account. Log in and add a product to your seller account. Do keyword research for listing optimization. Optimize your listing with your keyword list. Copyright © 2018 Key Tools Limited. Suite C, 2/F, On Lok Mansion, 39-43, Hollywood Road, Central, Hong Kong.